Welcome to Oidos - yet another 4k/8k synth! Oidos came into being around a year ago in connection with our Nexus 7 remake 8k intro Nexus 8. Its design is motivated by a desire to closely mimic the instruments from the original music. Great thanks must go out to Revival for his insightful ideas about additive synthesis which led to the development of this synth. The VST instrument currently requires a CPU with AVX support (around 2011 or newer). This requirement is probably going away at some point. The player code for inclusion in executables only requires SSE3. What jazzcat said! And make it fit into the 256 byte cache. 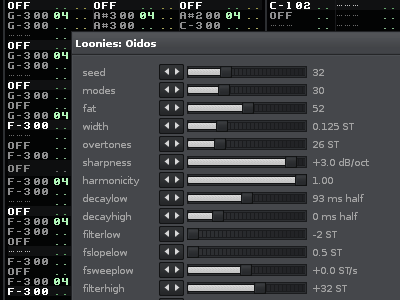 Please tell me .. how is the OidosReverb.dll supposed to work? Could be the same error as visy is seeing, though that will only show up if you use reverb (which, judging by your previous question, I am guessing you are not). Is there an error from nasm further up in the text (right after the "nasmw -f win32 oidos.asm -o oidos.obj" line)? The GitHub version of oidos.asm already contains a fix for that issue, btw. I will make a new release soon with that fix, support for non-AVX CPUs, plus maybe some other small fixes. Nice! Thanks for looking into it! The non-vectorized additive_core() is significantly slower than the vectorized versions (at least ten times slower than the AVX version, judging by the Renoise CPU meter). So it is fine for testing that things work, but probably quite cumbersome to use in practice. In the Windows VSTs, there are some accidental imports from the Visual Studio runtime DLLs, which cause the VSTs to fail loading on some Windows 7 installations. This can be remedied by linking statically to the C runtime. This feature currently requires nightly Rust, but it is supposed to be included in Rust 1.17 coming out next week. Will be fixed in the next Oidos release in any case. - Fixed compile error with old nasm, as reported by visy above. - Synth no longer requires AVX. - VSTs now available for Windows, Linux and MacOS. - Windows version no longer require the MSVC runtime DLLs, so it should work on more installations. - Option for the converter to color its output if your terminal supports ANSI escape codes. - Included the music from Cycle Of Nature in the examples. Big thanks to spiked-maniac and alkama for their help in building and testing the Linux and MacOS versions! w00t! thank you Blueberry! I will try the linux version!!! Only request : the ability to save a preset from the plugin itself. I often jam around in ModPlugTracker because I'm so used to it. I then smash out an IT to Renoise and have to remake all the patches from there. It'd be great - even for a copy-paste text field that just sets all the sliders. Would make patch sharing / online collab really quick too, Renoise rather than sending preset files around. Now if only I could have multiple unique instances of Oidos Reverb!!! page created in 0.025290 seconds with 15 queries.